Curry Fried Chicken is the fusion restaurant we deserve. The word "fusion" has become an interesting fixture among today's trendy restaurants. Indo-Chinese-retro fusion. Contemporary American-Afghani fusion. Franco-Fijian fusion. Whatever the cause for this gimmick, the true concept of fusion seems to be absent. But that doesn't mean fusion in the actual meaning of the word doesn't exist—it just happens to be much rarer than all those hyphenated upstarts would have you think. Fusion happens when you belly up to a bar to have your nose tingle as the smell of curry and samosas seamlessly blend with the smell of frying oil and crispy chicken. Fusion happens when a tray laden with mugs full of lassi makes its way past a trophy case full of cricket paraphernalia. In short, fusion happens at Curry Fried Chicken (660 S. State, 801-924-9188) on a regular basis. I've been a longtime visitor of this downtown gem, but I only recently learned that it shares a pedigree with Curry in a Hurry—both restaurants are owned by our local treasures the Nisar family. The Nisars have a knack for creating eateries that harmoniously blend their Pakistani and American heritage into warm, welcoming places to enjoy good food prepared with love. Taking something as quintessentially American as fried chicken, hitting it with an intoxicating dose of curry and spices and serving it alongside curried veggies and basmati rice is the living embodiment of such harmony. All the flavors work alongside one another—it's not a case of a chef trying to be edgy by slapping coq au vin on a plate with banh mi and calling it fusion. The food that they're preparing in the deep fryers and on the stovetops of Curry Fried Chicken is a culinary innovation analogous to the internal combustion engine. Each plate combines flavors and textures that completely change the way you think about fried chicken and curry. That, my friends, is why we go out to eat in the first place. As the place is called Curry Fried Chicken, the whole point of a visit is to take a deep dive into their iteration of a comfort food staple. 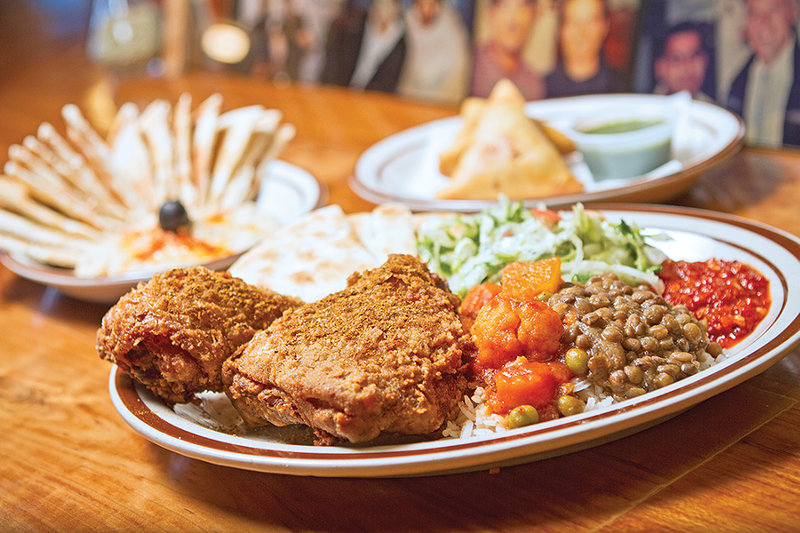 The curry fried chicken plate ($10.99) is the ideal way to do this, because you get a little bit of everything. The dish comes with a leg and a breast, a salad, warm flatbread and a side of curried veggies. It's a beautiful arrangement—I'll take curried veggies and rice over coleslaw and macaroni salad any day. That first bite of fried chicken is a love letter to the senses. There's a beautiful textural crunch followed by the sweet succulence of the chicken itself. At some point while you let all of that goodness party in your mouth, the heat of the curry flavor starts to kick in at the back of your throat. By this time, you're practically begging for another bite, so you dive in and repeat the process. It's not long before you're licking that flavor off of the bones that have arrived much more quickly than you were expecting. No matter how many times I come here, it's hard to pinpoint exactly what makes the fried chicken here so remarkable. My best guess is that, like Nashville hot chicken, the curry-fueled kick makes for a more exciting and flavorful bird, but that's not the end of the riddle. Something about the smoky, aromatic richness of curry locks step with fried chicken's natural flavor profile, and creates a savory bomb that detonates with every bite. That, and they nail the texture. Rubbery skin and a chewy crust have no place within these walls. Curry Fried Chicken does their outer layer right—they could market and sell bags of this stuff to put potato chips right out of business. For those after a less tactile dining experience, you can't really go wrong with any of their wraps—I like the curry fish kabob wrap ($8.99) because it takes the curry fusion process an extra step into fish taco territory. While I've found wraps as a food item to be melancholy little creations, the wraps here are gigantic and stuffed to the seams—they're definitely big enough to have for dinner. Much like the difference between those who know they're cool and those who say they're cool, Curry Fried Chicken is one of the few places around that knows how to pull off the fusion concept. A visit to this downtown eatery is a peek into a world where cultural and culinary identities merge to celebrate their similarities instead of criticize their differences, and it's a breath of fresh air in a world that seems bent on impeding those relationships. Come for the fried chicken, and stay for the unexpected cultural enlightenment. Friday and Saturday, 11 a.m.-9:30 p.m.